Inevitability is just about the only thing animating Jindal’s presidential bid. How badly Bobby Jindal must wish it were 2008, when he was newly installed as the nation’s first Indian-American governor and a rising star in the Republican Party. Rush Limbaugh declared him “the next Ronald Reagan”; The Washington Post, “a political meteor.” GOP insiders picked him as the antidote to the party’s monochromatic hue. “The question is not whether he’ll be president, but when he’ll be president, because he will be elected someday,” Steve Schmidt, John McCain’s top strategist, opined. Now inevitability is just about the only thing animating Jindal’s presidential bid, which he announced on Wednesday with an awkward home video posted to his Facebook page. “We have decided we are going to be running for president this year,” Jindal announces to his three children as they sit with his wife beneath a tree-shaded canopy. There’s a long silence. The kids look around. “That’s good?” Jindal asks with a tense laugh. He gets a thumbs-up. Jindal made Louisiana an experiment in socially conservative, pro-corporate governance that wrecked the state. You can’t blame the kids for failing to feign surprise; Jindal has often seemed more concerned with a future White House bid than his current job. That makes it all the more striking that in the clown car that is the Republican primary field, Jindal will be stuffed in with the spare tire; he’s polling at less than 1 percent of Republican primary voters. In Louisiana, his approval rating is 10 points lower than President Obama’s—a shocking gap, considering the contempt many Louisianans hold for the president, who lost the state by 17 points in 2012. Things are so bad for Jindal that his constituents would rather vote for Hillary Clinton. What went wrong? In sum, Jindal made Louisiana the test site for an experiment in socially conservative, pro-corporate governance that wound up wrecking the state so badly it can’t be ignored. After inheriting a $1 billion budget surplus, Jindal has taken Louisiana to a $1.6 billion deficit. The state is broke enough that conservative legislators are rebelling against his slavish adherence to the anti-tax pledge he made to Grover Norquist. Corporate Welfare: Louisiana loses $300,000 every time the A&E show Duck Dynasty films an episode. The state once gave an oil refiner $10 million to create 43 jobs. All in all, Louisiana directs over $1.1 billion in taxpayer money to business incentives—more than double the cost when Jindal took office. As the Advocate reported last year, these giveaways have deepened rather than alleviated the state’s economic woes. Education: To paper over the chasms of corporate tax breaks, Jindal has repeatedly robbed the state’s colleges and universities. Funding for higher education has been slashed by more than 43 percent since Jindal took office, a cutback exceeded only by Arizona. The flagship Louisiana State University may be forced to shrink its budget by 40 percent next year. Jindal also presided over the creation of one of the largest public-school voucher systems for K-12 grade students, which courts have twice ruled unconstitutional. Recent data suggests that Jindal’s much-publicized reforms are not delivering the promised educational gains. Health: Jindal’s record in this regard is particularly atrocious, considering that he once headed Louisiana’s Department of Health and Hospitals. Nearly 250,000 people don’t have healthcare because Jindal refuses to use federal money to expand Medicaid. Earlier this year a crucial emergency facility announced that it was closing because it couldn’t afford to treat so many uninsured. Other public hospitals have been privatized. Under his leadership STD prevention programs have lost millions of dollars in state funding, and some health clinics have been barred from opening. Louisiana now has the nation’s second-highest rate of gonorrhea and the third-highest rate of syphilis, along with some of the highest rates of HIV infection and teen pregnancy. Discrimination: A self-anointed champion of the Christian right, this spring Jindal bypassed the legislature and issued a “marriage and conscience” executive order to protect religious business owners who discriminate against gay customers. “I don’t know about you, but sometimes it feels like evangelical Christians are the only group that it’s okay to discriminate against in this society,” he said in Iowa this spring. Jindal has been a staunch defender of Duck Dynasty star Phil Robertson since he compared homosexuality to terrorism, among other things. Jindal isn’t the only current or former Republican governor to enter the primary after making a mess of his state. 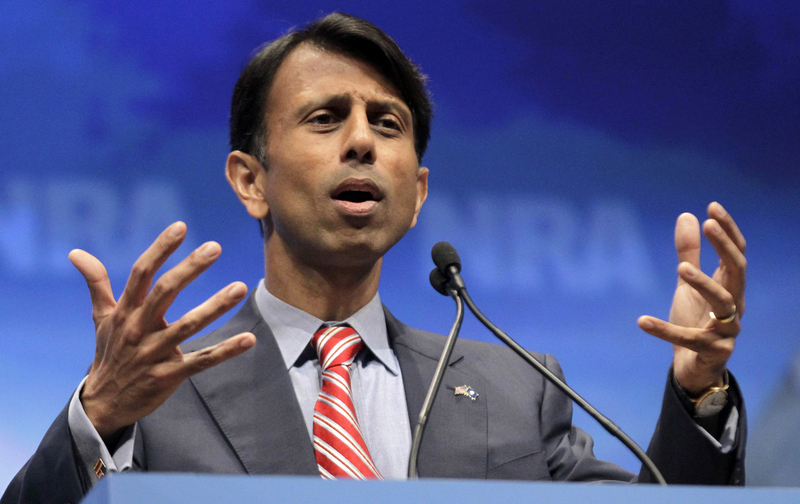 But thanks to the conservative backlash back home, Jindal’s mess is particularly toxic. What’s fascinating is how Jindal has morphed from a politician with a serious, almost nerdy policy focus to an ideologue with a reputation for mismanagement. The guy who once admonished the GOP to abandon “dumbed-down conservatism” has embraced it fully.